Most of those were linked to or posted on an old SFI topic about the macahuitl. I don't recall the gentlemens name but he was very serious about his knapping of both obsidian and flint. Errett Gallahan (http://www.errettcallahan.com/). I actually met him by chance in Denmark, when I visited Lejre. He and D.C. Waldorf (http://moundbuilderbooks.com) are IMO the best flint knappers currently alive, and maybe even the best that have ever lived. If there's any craftsmen I look up to, it's them! Anyway, yes he's truly very talented. He was sitting there turning out arrowheads as we chatted. Interesting fellow. Gordon already noted the decapitated mare incident from Diaz; the man who rode that mare was Pedro de Moron. The Conquistadors appear to have had a healthy respect for the maquahuitl's power. Diaz refers to it in the English translation of The Conquest of New Spain as a "dreadful broadsword" and "two-handed cutting sword" (though, I would love to know if this is a truly accurate translation from the Spanish). It's still worth nothing that the maquahuitl had its limits--the modern term "sword-club" certainly describes this weapon, since it could cut, but was still essentially a club in terms of balance. 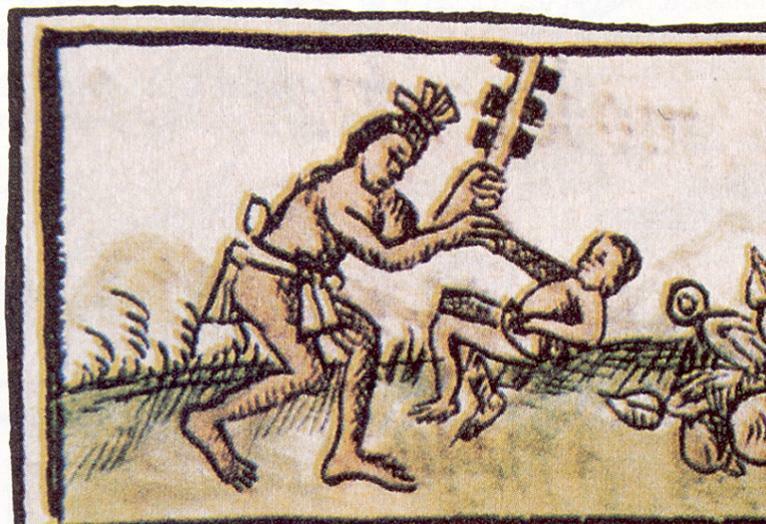 Writing long after the Conquest (in 1596), Geronimo de Mendieta noted that the Aztecs "had no style of fencing". This contrasts fairly sharply with the common talk among Spanish soldiers regarding the various tribesmen in the Philippines, of whom it was said, "They fight like Moors, and defend themselves like Turks". Then again, the Filipinos also had metal swords--kampilans, krisses, and such. 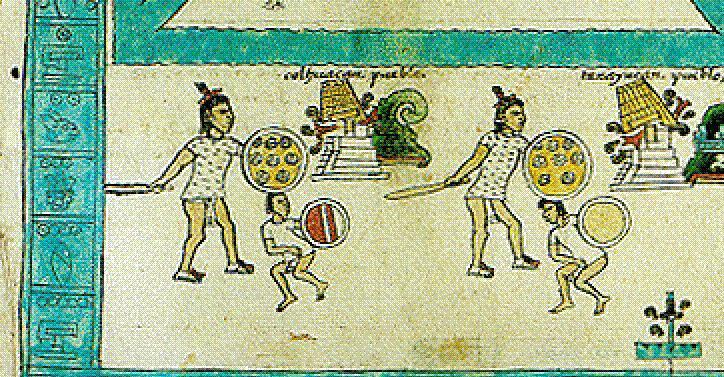 As for the maquahuitl's effect on armor, I would think that good plate would stand up to it, but how many Conquistadors had good plate? Maille was still a very common defence, as were brigadines--like plate, I suspect that these could both stop a cut from a maquahuitl, but what about the issue of blunt trauma? We should also keep in mind that the native Aztec armor of quilted cotton and maguey fibers (the ichcahuipilli, called escaupilla by the Spanish) was also popular with the Conquistadors due to its lightness and usefulness against arrows--but what would a maquahuitl do to such an armor? I originally asked the macahuitl vs plate armor as a hypothetical, but I think given the reconstruction examples we've been looking at, it's not as large a weapon (nor as cumbersome) as I first thought. Additionally, the murals and paintings all represent this as a single handed weapon used in conjunction with a shield, so I now doubt that the concussive effect would be any greater than a good cudgel. The obsidian blades are smaller than I had first imagined. Oh by the way, one of the sites I searched in regards to this topic mentioned that obsidian was "the stone of the gods", so its not a huge leap to think that it was the primary stone used for this application. - Macahuitl: wooden club spiked with obsidian blades. - Obsidian is the sharpest substance in the world (next to diamond) and is used to this day by eye surgeons. Our Macahuimeh outmatch any steel sword and with one stroke, they are able to decapitate a horses head. - Tematlatl - slings made of maguey fibers. Rounded stones were hurled at a distance of over 1320 feet and caused major damage. Some slingers were said to have heated the stones to a scalding degree and upon impact, the stones would burn straight through the body. sounds like the katana of meso-america I do recall the horse head lopping in my reading some where. Also that the Spaniards had a great respect for their power. As far at their effectiveness aginst plate goes...I think that they would have caught on very quickly that you cant cut through it and would go for the limbs. I recall seeing several images from various codexes (is that the plural form?) showing lots of severed arms heads and legs. Which is also another testament of an establish sword and shield technique. I'll see if I can locate some of those images. Some slingers were said to have heated the stones to a scalding degree and upon impact, the stones would burn straight through the body. Uh-huh... If they managed to heat them up to plasma stage, and fired them through a particle accelerator perhaps.... Sound like a nice challenge for Mythbusters! In any case it ended up being a dead horse ! Wonder what the Spanish did to the guy though: Nasty and terminal if they caught him ! If the cut was deep enough to reach a major artery it did the job: The only reason for it to not have completely decapitated the horse would be the thickness of the club and not due to any lack of scary sharpness. Nearly a couple of decades ago I was involved with primitive archery and gave knapping a good try. I've never made such a dangerous mess. If you want to give it a go, eye and lung protection is a must. Making a proper core to purcuss regular shaped blades from is extremely difficult. Pressure flaking a lucky chip into a point is much easier. When obsidian flakes off to a zero edge that is as sharp as it gets and these retouched flakes made by best killing points as opposed to having a proper, thin biface. I was working from Waldorf's third edition finding some but mostly buying at a dollar a pound. It sounds cheap but it's not really there is much waste until you can make a proper core which takes alot of practice and skill. I made a more N American looking club setting some of the better but still unusable bits in a groove with pockets to seat some of the thicker bases. glued in with pitch. Damaging these was quite easy, removing the ones that broke off was very difficult. The idea that these would have any effect against metal armor is just not realistic. On a program about the Inca(I know you have much respect for the one eyed idiot box as a source but they had an interesting take on S American warfare.) It stated the idea was not to kill on the battlefield but deliver crippling wounds for taking prisoners to sacrifice. Bleeding on the battlefield, taking or becoming a prisoner was considered cool. If I was to make one today I would find someone with a lapidary saw and have them cut thin slabs of obsidian With some practice these can be pressure flaked fairly easily. I could make one but it'd cost ya 'cause I'm greedy. My guess most of the large thin blades seen for sale today are made this way. not much academia but this is my personal experience. I hope it helps a lil bit. Thanks for the insight, it's always useful to hear from someone that has been there and done that. Sorry for revving this old thread. I just saw this wonderful topic. Has anyone tried to replicate such a sword? I would love to see one. Actually I have been looking for it for years, just to see a replica made of it. The now out of print book, Swords and Hilt Weapons by Peter Connolly, Harding, Harris, Larocca, Richardson, North, Spring, and Wilkinson Coe hasa picture of a series of flint or obsidian chips found in a Danish grave that were clearly intended to be used as the cutting edges on a double edged swprd of some size. IIRC, the author of that segment said that it was his belief that the matrix had been a hardwood that had rotted away.